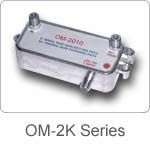 The OM-2000 series are super wide band and dual direction type amplifiers for indoor CATV use. Various bandwidths are available in accordance with customer specifications. The options for reverse band are 5-30/5-40/5-55/5-65 Mhz. The other path is main band. The excellent specifications are design to maximize picture quality.